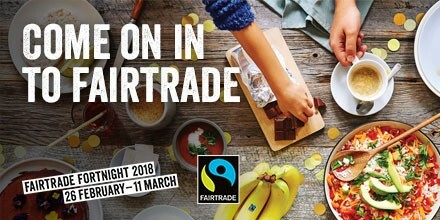 Fairtrade Fortnight 2018 invites you to come on in! 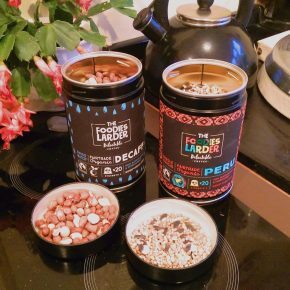 The 2018 Fairtrade Fortnight (26 February – 11 March 2018) is encouraging all consumers to come on in and find out what delicious and unusual products there are on offer for you to enjoy. Thousands of events will take place including breakfasts, breaks, bake-offs and more as people ‘come on in’ and find out more. But if you just want to do your bit in the next 2 weeks and forever more, whether you’re sharing a cup of coffee and a bar of chocolate with your neighbour or grabbing a snack on the go, make sure it’s Fairtrade and remember you’re making a difference. Opening your door to Fairtrade! All around the world thousands of farmers and workers are working hard to produce the things you love, whether it’s that morning cuppa or evening glass of wine. Show you’re support and close the door on exploitation by choosing Fairtrade and help transform the lives and futures of more than 1.6 million farmers and workers in developing countries! We all have the power to make ethical choices and create a legacy that our children can be proud of. Our Fairtrade farmers are no different, working hard each day to shape a positive future for their families and communities. This is exactly why we fill our eco coffee capsules with Fairtrade coffee, helping to break the stranglehold of poverty prices while offering coffee lovers a product that won’t cost the Earth. By doing so, we’re taking our legacy into our own hands while we have the chance, so join us and do the same by choosing Fairtrade products every time you shop…your children and those of Fairtrade farmers across the world won’t regret it! 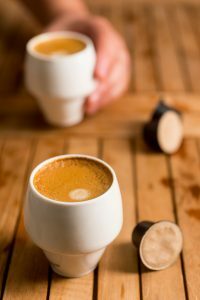 Fairtrade is actually synonymous with coffee and was created in response to the dire struggles of Mexican coffee farmers following the collapse of world coffee prices in the late 1980s. Today, Coffee is one of the world’s most popular beverages and 80% of it is produced by 25 million smallholders. But many of them fail to earn a reliable living from coffee. 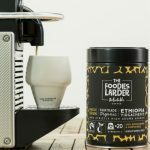 Around 125 million people worldwide depend on coffee for their livelihoods, with Coffee the most valuable and widely traded tropical agricultural product. But Coffee is well known for being a boom and bust commodity. Global coffee production varies from year to year according to weather conditions, disease and other factors, resulting in a coffee market that is inherently unstable and characterised by wide fluctuations in price. 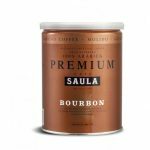 This price volatility has significant consequences for those who depend on coffee for their livelihood, making it difficult for growers to predict their income for the coming season and budget for their household and farming needs. The coffee supply chain is complex as beans pass hands through growers, traders, processors, exporters, roaster, retailers and finally the consumer. Most farmers have little idea of where their coffee goes or what price it ends up selling for. The more lucrative export of green coffee – beans that have been processed ready for export and roasting – is only an option for farmers if they can form co-operatives, purchase processing equipment and organise export or hire a contractor to carry out these services. 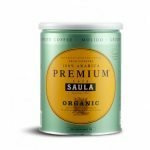 What price do Fairtrade coffee growers receive? 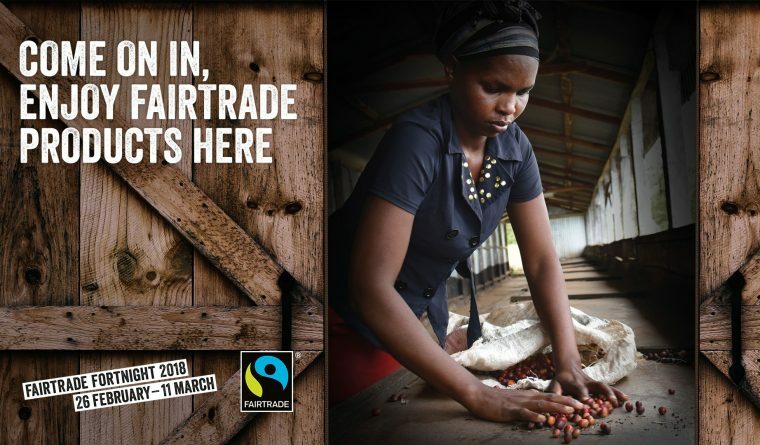 Fairtrade describe the process on their coffee pages: “…certified coffee producer organisations are guaranteed to receive at least the Fairtrade Minimum Price for their coffee, which aims to cover their costs of production and act as a safety net when market prices fall below a sustainable level. Through their producer organisations, farmers also receive the additional Fairtrade Premium to invest in business or community improvements. Who are the Fairtrade Foundation? In their own words…Fairtrade is a global movement with a strong and active presence in the UK, represented by the Fairtrade Foundation. It is a movement for change that works directly with businesses, consumers and campaigners to make trade deliver for farmers and workers. The international Fairtrade system (which the Fairtrade Foundation is a part of) represents the world’s largest and most recognised fair trade system. We are a global organisation working to secure a better deal for farmers and workers. Our hundreds of Towns, Faith Groups, Schools and Universities and committed supporters are vital in helping us realise our vision of fair trade. Our organisational strategy for 2016-2020, FAIRTRADE CAN, I CAN, sets out our ambition to deliver greater impact for producers, and engage even more of the UK public in shopping and campaigning for a better deal for farmers and workers in developing countries. The Foundation was established in 1992 by CAFOD, Christian Aid, Oxfam, Traidcraft, Global Justice Now, and the National Federation of Women’s Institutes. Member organisations now also include Banana Link, All We Can, National Campaigner Committee, Nicaragua Solidarity Campaign, People & Planet, Scottish Catholic International Aid Fund, Shared Interest Foundation, Soroptimist International , Tearfund and Commitment to Life / United Reformed Church. « The Charms of Chorizo….Everything you ever wanted to Know! Bling your tin...or let your kids loose on them!